When the team you root for isn't in the postseason, it's hard to find anything to write about. I've been digging around to find, well, anything really. Did you know that the Mariners might have an extension with Felix Hernandez either right before or right after the World Series? Then 5 minutes later, no, no they're not. They haven't even talked about an actual extension and no numbers have been discussed. I'm not going to get into the extension talk stuff because if he signs, yay! If he doesn't, he still has two years left on his contract and both Jack Z. and Felix have said he's not going anywhere. Instead, a quick mention of who is playing for the Peoria Javelinas from the Mariners organization participating in the Arizona Fall League is what's going to be written about. At least, for the post that's currently being written for this specific blog. Other people write different things about the Mariners and you can read about that stuff too because that's why people write things. This isn't exactly an update so much as it's about who from the Mariners are actually on the team and a little about what to look for in the next month from them in the AFL. The stats themselves aren't going to tell you much at this point, since they've only been playing less than a week and most guys are right around 8-10 at bats each. A lot of pitchers haven't even pitched a full 3 innings, whether starting or relieving, so stats aren't going to give you any kind of insight. Unless he went 1/3 of an inning and gave up 8 runs. Even then, one bad game doesn't turn a prospect into a four-A player. Same goes for 9 innings of perfection. With all that said, updates! The first player you come across when going right down the list is reliever Logan Bawcom. You may remember he came over from the Dodgers, along with Leon Landry, in the Brandon League trade. With AA Jackson, he kept his ERA at 1.88 but had more than a walk an inning with 15 in 14 1/3 innings. He also had 15 strikeouts and only six hits, but apparently the airline lost the luggage with his control in it, because he didn't bring it with him. It was a very small sample size, so taking too much away from 14 1/3 innings isn't ideal, but it's worth nothing nonetheless. In the AFL, he's only thrown one inning, giving up a run (unearned) on no hits, a walk and a strikeout. Next up is reliever Bobby LaFromboise. Some of these guys all I've got to go on is the Baseball Reference site and the stats they have on there. I'll readily admit, this is a guy who hasn't even been on my radar. Like, ever. The Mariners drafted him in the 8th round of the 2008 draft out of University of New Mexico after being drafted by the White Sox in the 23rd in '05 and the Diamondbacks in the 14th in '07. As a starter, he wasn't exactly a prospect. He was giving up quite a few hits and the walks weren't very impressive. However, in 2011, he was strictly out of the bullpen full time and has flourished since. Between Jackson and Tacoma in 2012, his strikeout rate was over 1 an inning. His control is starting to improve and could make a play for the bullpen next year if he gets put on the 40-man roster. In the AFL, he's also only thrown one inning thus far, with no hits and no runs allowed, one walk and 2 strikeouts. James Paxton is a guy I'm sure most Seattle fans know. Part of the 3 headed beast in AA Jackson this year along with Danny Hultzen and Taijuan Walker, Paxton again was limited by control problems. His walks per nine for 2012 was over 4.5, but also had a strikeouts per nine of 9.3. He has the stuff to punch hitters out, but he's going to have to work on his control if he's going to stick in the majors. A 4.6 BB/9 in AA doesn't generally translate well to the higher levels. In the AFL, he's gone 3 innings with no hits, no runs, a walk and five strikeouts. He's a guy to keep an eye on in the AFL and next year in the minors to see if he can get on track. Carson Smith is a reliever I'm sure most Seattle fans didn't even know existed. He was drafted in 2011 in the 8th round by the Mariners and since the signing deadline for the draft was still late in the year that year, he didn't pitch for the organization until 2012. With high A High Desert, he threw 62 innings in 49 games. He may be in the discussion to be a reliever with the big league club by 2014 if his High Desert numbers are any indication, which they're not since it's only high A. He kept his ERA down at 2.90 and struck out 77 batters. He walked 28 hitters, which isn't bad, especially since he started his pro career in high A. So far in the AFL, he's thrown 2 innings while allowing a hit, no runs, a walk and a strikeout. He's another guy to keep an eye on the next month. Odds are good he may start in high A next year, but probably finish in AA Jackson. 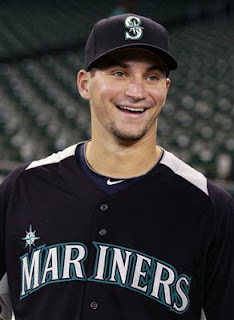 Hopefully everybody and their Mariner fan relatives know about Mike Zunino. He was selected 3rd overall in the 2012 amateur draft and tore up low A Everett for the 29 games he was there, hitting .373 with 10 homers, 10 doubles and only 26 strikeouts in 133 plate appearances. His OBP was .474 in low A and the organization got the message quickly. He was promoted to AA to finish the season, getting his feet wet with 57 plate appearances with Jackson. In the exceedingly small sample of time in AA, he hit .333 with 3 homers, 4 doubles and 7 strikeouts with a .386 OBP. He's a defense first catcher from what I've read, but his hitting is leading the way right now. In his 31 games on defense, he had 4 errors and 9 passed balls. His defense isn't really a concern though, as far as his long term projections anyway, and he may be a surprise call up by mid season in 2013, if not September. AFL stats aren't going to tell you anything, especially since he's only gotten 8 at bats so far, but I'll put them up anyway. He's hitting .125 with a walk and a couple of strikeouts, but again, only 8 at bats. Rather than going in depth on their seasons, I'm going to lump infielders Nick Franklin and Vinnie Catricala into one post. These two guys have been discussed, dissected verbally and judging their seasons via stat lines is insulting to the players. Neither player is ready to take over full time for any of the MLB regulars the Mariners currently have, but may late next year or 2014. If you're expecting Franklin to start next season at SS for the Mariners, do yourself a favor and stop. His bat isn't quite there yet and his defense isn't either. Catricala took a step back last year, both on offense and defense. It's also possible he wasn't ready for AAA Tacoma and may be next year, so he's a wait and see. In the AFL, Catricala has yet to get a hit in 8 at bats with no walks and 3 strikeouts. Franklin is 3 for 8 with no walks and 2 strikeouts. Franklin is one guy we know fairly well already. Catricala is going to be the one to watch. Last but not least is Stefen Romero. He started the season in high A High Desert and finished up in AA Jackson. His season was split pretty evenly between the two levels with 276 plate appearances in high A and 240 in AA. He hit around .350 at both levels, opening a few eyes in the process. He was slightly old for high A at 23 years old, which probably helped, but still nothing to sneeze at. He struck out only 72 times in 516 plate appearances last year, but only 27 walks. That's not horrible, especially for a young player, but it's a number you'd like to see improve. It's not a disaster if he doesn't, but walking tends to be a good thing for both health and scoring runs in baseball. He was a breakout player in 2012 and he's a guy to keep an eye on for a full season in AA and possibly AAA next season. For now, in the AFL, he's gotten a hit in only 4 at bats with no walks and no strikeouts. If you decide to keep an eye on these guys in the AFL, keep in mind it's not a league where stats are everything and prospect status is solidified or lost. It's a league to give players a little more time to work on whatever they need to work on and give players like Zunino a little more time in a professional type of environment. Stats do mean a little something, but if Catricala or Romero hits .100 in 30 at bats, it doesn't mean a whole lot. Unless he struck out 25 times in those 30 at bats, then be concerned. Regardless, have fun with it and let's root for the players in the Mariners organization still on the field while we still can.